With unprecedented change sweeping the automotive industry, it’s more important than ever to achieve breakthrough performance through digital transformation of the automotive supply chain. Thousands of companies including automotive and industrial suppliers, OEMs, carriers and freight forwarders are already on the Real Time Value Network. Challenged with Industry Disruptions: Shift Into Digital from One Network on Vimeo. 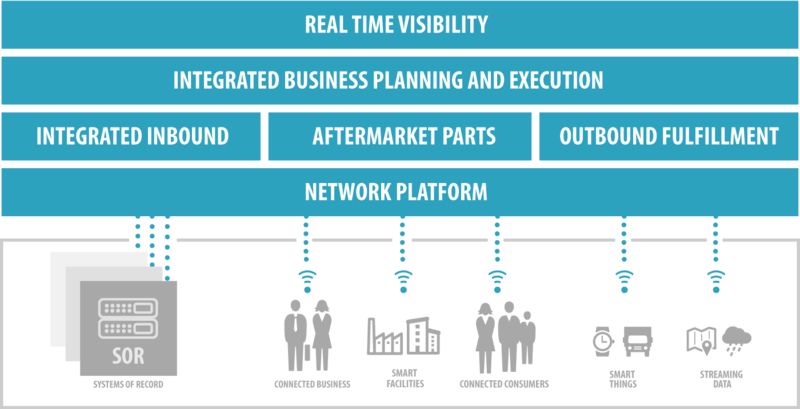 One Network’s cloud platform provides a single, real-time, end-to-end operating backbone with intelligent agents that manage planning, execution, and orchestrate transactions across OEMs, all supplier tiers, dealers and logistics providers. The result is unprecedented visibility and control across your automotive supply chain, lower inventory, and increased agility, while reducing total system cost to deploy, maintain, and support. Watch the Real Time Value Network in action. Learn how automotive companies can collaborate in real time, to improve service and reduce costs and speed up the supply chain. What Digitizing the Supply Chain Looks Like (The RTVN Perfect Storm) from One Network on Vimeo. The actual results for inventory reduction that we have realized is double the goal that we initially set out to achieve and we identified specific products where inventory reduction could be reduced by 40 percent or more. One Networks marries planning and execution applications into one console to provide end-to-end supply chain visibility for course correction; thereby, eliminating the traditional divide between planning and execution. The RTVN enables visibility and data to flow across the entire value chain of business partners – in real-time, which brings supply chain visibility and performance to an entirely new level. One Network is the leader in control tower technology that drives tremendous operational efficiency improvements. This solution provides end-to-end visibility across your business and your partner network including visibility to on-hand and projected inventory for all suppliers at all tiers in your network. This solution enables a best-in-class process with multi-scenario analysis for consensus demand and supply planning. The solution creates planned orders (instead of guesses), nets these orders against inventory and creates operational plans (i.e. distribution, logistics, production plan and raw material plans) to meet demand. One Network’s Integrated Inbound solution is the only offering that delivers synchronized capabilities across orders, supply chain and logistics in a single solution. The solution dramatically reduces inventory and carrying costs, reduces the logistics premium freight and expedites, and lowers the IT expense. One Network’s Outbound Fulfillment is an end to end solution for order fulfillment in Business to Consumer (B2C) as well as Business to Business (B2B) settings. The solution continuously orchestrates execution for you and your trading partners optimizing for demand/supply priority, inventory positions of the demand sites, available and capable to promise supply, logistics capacity, and air and freight schedules. This solution provides visibility and drives execution efficiency across the network by orchestrating the optimized fulfillment of aftermarket parts orders from suppliers through a distribution network to dealers and stores. Freight audit capability ensures that the right contract rates have been applied for lowest operating costs. ONE Platform is an application Platform-as-a-Service (aPaaS) and is designed for multi-party network ecosystems from the ground up. ONE Platform development tools enable rapid development of innovative, supportable, Software-as-as-Service (SaaS) applications for business networks. Shorten your software development lifecycle using our aPaaS. One Network’s Control Tower is a network-based Command & Control Monitoring station, that gives you insight and control over your network. Community Master Data Management Network Service enables multi-party networks to connect to ONE’s Community Master Data service for sharing and replicating master data in a federated network. ONE’s Asset Management Network Service provides functionality for managing the lifecycle of serialized assets, including tracking and maintenance. Blockchain-enabled chain of custody for the real world applications like lot splitting and merging, partial chains of custody. Demand Planning app provides traditional demand forecasting algorithms, along with additional innovations such as Continuous Forecasting. The Financials Network Service provides an implementation of financial business processes including invoicing, invoice holds, and the management of financial accounts. The Global Supply Demand Match (SDM) Network Service provides a rich UI environment for visualizing and reconciling supply and demand in an international setting. Orders can be prioritized and allocated among multiple ocean containers to optimize the supply chain. The Inventory Planning Network Service provides sense-and-respond agents to help you automatically calculate ideal inventory policies, such as safety stock, across your inventory. ONE’s Manufacturing Network Service provides features such as factory-floor management, production order management, bill of materials management, demand translation and more. ONE’s Order Management Network Service provides a full end-to-end solution for the management of multiple order types, including Purchase Orders, Sales Orders, Deployment Orders and more. It also supports Contract Management and numerous vendor analytics. The Replenishment app provides a rich set of sense-and-respond agents which help to automatically re-order product based on both long-term projected demand and near-term execution realities. The Scheduling Network Service provides a set of business process and user interfaces for scheduling access to shared resources. For example, scheduling dock door deliveries to distribution centers and other warehousing locations. The Sales and Operation Planning Network Service allows ONE to conduct SNOP planning, marrying it with actual execution data from other ONE Network Service and legacy sources. Social Network Services provides unstructured collaboration tools that include Chat, with point-to-point live chat; Chat Rooms for group discussions and Blipper, a twitter-like micro-blogging platform. Blipper enables you to follow people, companies and products on the network, and broadcast to your followers. The Transportation (TMS) Network Service covers all aspects of Transportation execution, including carrier tendering, shipment tracking, carrier contract management, transportation optimization algorithms and more. The Warehouse Management (WMS) Network Service covers all aspects of Warehouse operation, including the modeling of warehouse locations, tracking of inventory (including lot & serial assets), cycle counting, license plating and more. The Yard Management app allows one to manage trailers in a yard, providing visibility into current yard slots and operations like check-in/check-out.